FountainBlue’s monthly top-ten rules of marketing are designed to guide our client entrepreneurial tech companies and the community in general on marketing practices that clearly communicate and connect, thereby generating momentum for people and organizations. This month’s top-ten-marketing rules topic will be on the top ten ways to build a community around your business, leveraging non-tangible social currency. If you go with the tenet that momentum is at the heart of all business successes, then it follows that in the new age of building business where the consumer is king and technology is leveraged to deliver custom solutions, then creating a community around your business, engaging stakeholders at all levels through social currency is paramount for the business. Below are ten ways to build a community around your business, leveraging non-tangible social currency. Find Win-Win Opportunities to Engage Select Ambassadors. 1. It’s a win-win if your company brand can enlist the right ambassador(s) to complement and extend that brand. It’s good for the company, and good for the community and individuals as well. 2. You could also enlist ambassadors by geographic location, extending your current brand and reach beyond what currently exists. It’s a win for the company as they extend to new territory, and a win for your ambassadors, who can associate with a respected brand, service and product, and extend the value and the reach of same. Recruit Contributors and Managers to build the message and the community. Content experts add credibility to your community, and create relevant, timely content which educates, informs and engages. They gain social currency by writing on-topic to a relevant community and followership and receive recognition and esteem for doing so. 4. Activists can moderate community discussions on relevant topics while participating in the vibrancy and viability of the community, which benefits all. Promote and Reward The Participation and Involvement of Your Advocates. Recognize your community leaders on the web site, in meetings and events, every chance you get. Many of the most engaged leaders respond well to this, provided that it is done well, and provided that they see fellow contributors as their peers. Additional social recognition for the most eager and enthusiastic supporters can be very motivating for all, providing that this is done fairly and well. 7. Tangible rewards are also at times appreciated, but generally not as coveted as social, non-tangible rewards for the most part. By definition, your advocates will be closer-to-the-needs-of-the-customer than you are, so Enlist Their Input about how to better serve people like them. 8. Start with the needs and challenges of the customers rather than with a technology innovation which may serve the customer. 9. Develop and enhance your user interface to meet the needs of your customers. 10. Get insights from your advocates on how to expand technologies and brand into new markets. We conclude that marketing has evolved with the times, and it will be much more about authentic advocacy, committed volunteers and social currency than it will be about PR, search engine optimization and ad-buying, although that will remain important. The challenge is to build that community and social currency that benefits all. Your thoughts on our leadership and marketing blogs are welcome. FountainBlue’s November 9 When She Speaks, Women in Leadership Series event, on the topic of The Business Case for Diversity. Below are notes from the conversation. We were fortunate to have a wide range of perspectives on our panel, and that our panelists shared their insights, suggestions and advice with poignant humor and candor. Although each panelist spoke with a different viewpoint and perspective, and approached diversity from a different angle, they shared many common traits: early experiences which helped them think more broadly about people and about the world; ongoing exposure to a wide range of environments throughout their professional and personal careers which exposed them to diverse settings, people, perspectives, situations and companies; successes and failures in a business setting, working with people, teams and management who did not think just like they did; and the desire to continually learn and grow, embracing new thoughts and perspectives for themselves, their teams and their companies. 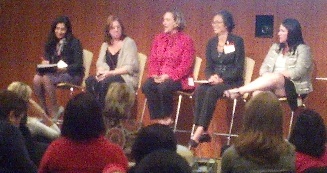 Our panelists agreed that diversity was a business advantage for many reasons. First and foremost, welcoming people of different backgrounds into a team, into a business relationship as a partner, customer, or other stakeholder, or otherwise into the business ecosystem will in the end foster momentum for the organization, through sales, marketing, relationships, etc. Secondly, with the inclusion of people with different perspectives into the team, an organization is much more likely to create solutions which meet the needs of its diverse partners, customers, investors, etc. Thirdly, a person, team, or organization which truly embraces diversity in words and deeds, in general have a more resilient culture, a more tolerant mind-set, and can attract and retain the most prized and talent employees. Fourthly, as a company, the broader your perspective, the larger the market opportunity. Have the self-awareness to know who you are, what you’re good and not-so good at, and what pushes your buttons. Act and speak in an authentic voice, standing behind your core values. Condition yourself to embrace change, to question how-you’ve-always done things and what you think is right and wrong. Embrace change, and people who welcome change, as complacency is the antithesis of innovation. You are your biggest cheerleader, so cheer for your own cause. It’s OK to raise the bar for yourself, but not at the expense of your confidence. Leverage a mentor to help you know, manage and accept yourself, and stretch your view of yourself and of the world. Be Curious about People Who Don’t Think and Act Like You. When someone pushes your buttons, think ‘Different is different, not wrong’. Don’t clump people by gender, age, ethnicity, etc., but do evaluate them on what they do, how they behave. Communicate to others in a way they understand. The use of idioms for example can be quite confusing for those who are not native English speakers. Make a stand for your colleagues in work situations who are singled out and/or penalized for presenting a differing point of view, just because it’s different. In managing conflict between people who think different, keep it professional and stick to the facts, staying away from personal attacks. Always Focus on the End Game. Build deep relationships of trust to help manage inevitable conflicts between people who think differently. Think first about the goal, and embrace diverse thinking and suggestions, provided it helps achieve that goal. Insist that your team and organization advance people based on merit, not politics. Whether or not you’re in a position of authority, work with people and teams around you to embrace change, to welcome diversity. Support high-potential men and women in your team, and actively participate in groups that also do so. Always focus on doing the greater good in the short term and the long term. Know what that greater good is, and be transparent in your communications about why you are taking the actions you’re taking. In the end, our panelists agree that diversity is a business advantage, and that people, teams and companies who truly embrace diversity will reap the rewards. Please join us in thanking our gracious hosts at Adobe.